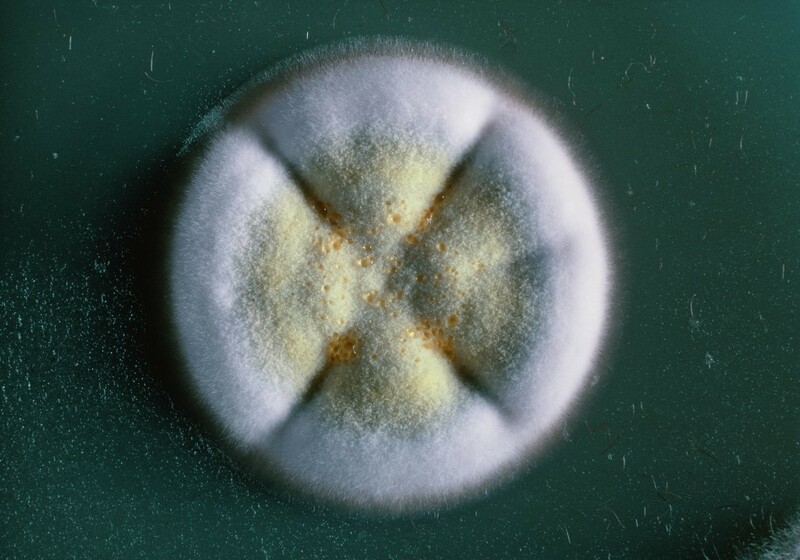 The common soil fungus Trichoderma. It secretes huge quantities of the enzyme cellulase. Cellulase speeds up the breakdown of cellulose into sugars. Biofuels are made from living things or the waste that they produce. One of the most common biofuels, ethanol, is produced from plants. The plant material used is the edible part of the plant such as sugar cane (Brazil) and sugar beet (France) or corn kernels (USA) because it can easily be broken down to sugar (glucose). The sugar can then be fermented (broken down) to ethanol by microbes such as the yeast Saccharomyces cerevisiae. Not only is it expensive to convert edible plant material into ethanol; ethical issues are also involved. It has been argued that we shouldn’t grow food stuffs for fuel when people in some developing countries don’t have enough to eat. There is a worry that Brazil will remove large sections of their rainforest to produce sugar cane. This is an issue because the trees in the rainforest use up huge amounts of carbon dioxide while carrying out photosynthesis. As a result biofuels from food stuffs such as sugar cane are unlikely to provide a long term solution as a replacement to fossil fuels. Scientists are investigating the use of cellulose to produce ethanol. The ethanol produced from cellulose is exactly the same as the ethanol that is created from edible plant parts. Cellulose ethanol is produced from lignocellulose which is a mixture of lignin, hemicellulose and cellulose. These three materials make up the plant cell wall. The lignin is the glue that holds the cellulose fibres together and gives the plant its rigidity. The lignocellulose is the part of the plant that remains undigested by humans and most animals i.e. it is a non-foodstuff e.g. stalks, sawdust and wood chip. There is a huge amount of non-edible plant waste to recycle. Scientists have turned to their attention to microbes to see if they can find any that are capable of converting the cellulose and even hemicellulose in lignocellulose into ethanol. The remaining lignin by-product can be burned to produce energy. They have looked in the strangest of places from termites’ stomachs to the soil surrounding volcanoes. What they have found is a range of very different microbes that all have one thing in common - they produce a group of enzymes called cellulase. An archaeon Sulfolobus solfataricus lives in volcanic pools near Mount Vesuvius in Italy. It produces cellulase. Researchers are looking at ways of genetically modifying this microbe to see if they can get it to improve its performance and produce more cellulase. In the future S. solfataricus may be used to produce biofuel. Another common wood digester is the fungus Trichoderma reesei. It is found in nearly all soils and secretes huge quantities of cellulase. The fungus was originally discovered by the United States army during the Second World War. It was responsible for breaking down the cellulose in the soldiers’ canvas tents and uniforms which meant they became very holey. It was known as ‘jungle rot’. A company in Canada has harnessed the microbes’ ability to convert straw into glucose. The company genetically modified the fungus so that it produces even larger quantities of cellulase. A staggering 75 % of the straw fibre is converted into sugar. The left over woody matter, lignin, is dried and then pressed into burnable cakes. The glucose is then fermented with yeast to produce the biofuel ethanol. Could algae be a realistic alternative to fossil fuels? Algae carry out photosynthesis. They use the energy from sunlight to convert carbon dioxide into sugar, which they then metabolize into lipids. Algae lipids can be processed into biodiesel while algae carbohydrates can be processed into bioethanol. This works well in the laboratory in small-scale bioreactors. Scientists are investigating if it is practical to grow algae on a large enough scale to see if they may be the biofuel producers of the future. Microbes could well be the key to powering cars in an environmentally sound way and in the not too distant future we could all be filling up at the pump with microbial-based fuel! Will climate change have an impact on health and affect the spread of diseases such as malaria?